Starting in the 1970s with the very first Earth Day, reduce, reuse and recycle is a mantra many of us have wanted to follow. If recycling and crafting are important in your life, this paper craft project is for you! 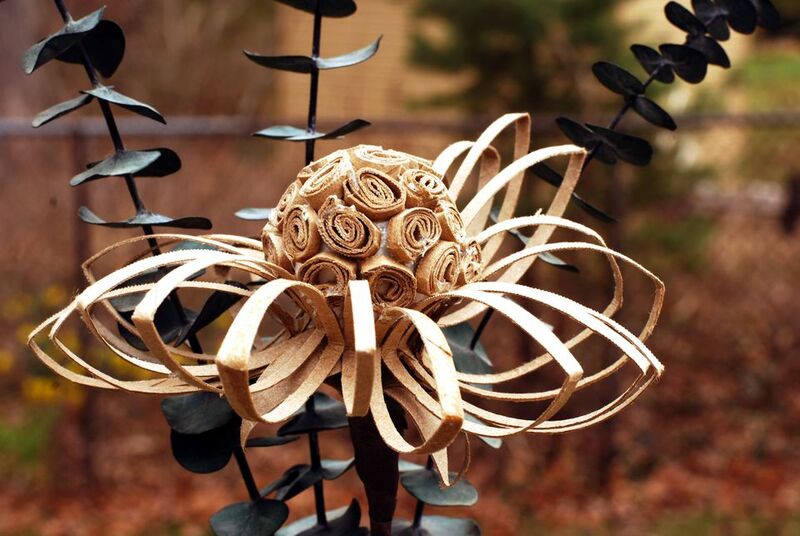 Not only will you help the environment by repurposing leftover cardboard, but you will also have a lot of fun making beautiful paper flowers. This craft reuses leftover cardboard tubes from toilet tissue, paper towels and wrapping paper. Items which we typically throw into the trash. This paper flower craft is so lovely that at first glance it is hard to believe it is constructed from the humble toilet paper roll. Another plus is that it also doesn’t cost much to make. How amazing is that? So collect those tubes and start making paper tube flowers! You will have a beautiful paper flower collection in no time that costs almost nothing to make! Cardboard tubes from toilet paper rolls, paper towel rolls or wrapping paper rolls. Cut your tube into 1/8 inch wide circles. You will need approximately 28 circles for the spiral centers of the flower, and approximately 22 circles for the petals. Flatten and roll a circle into a spiral as in the photo above. Secure the edge with a bit of hot glue. You will need about 28 cardboard spirals in total. Tip: If you have a lot of hot glue strings, blow hot air from a hair dryer over the glue strings, and they will magically disappear! Insert the dowel rod halfway into a Styrofoam ball center making a hole and then remove the dowel from the styrofoam ball. Place some hot glue into the hole in the center of the styrofoam ball. Place the dowel once again into the hole and secure the dowel with a bit of hot glue. Starting at the center top of the Styrofoam ball attach the cardboard spirals with hot glue around the top half of the ball. Continue gluing spirals until half of the Styrofoam ball is covered as in the photo above. You will need approximately 28 cardboard spirals to cover one half of the Styrofoam ball. Blow some hot air from a hair dryer over the Styrofoam ball to remove excess hot glue strings. Using hot glue, glue approximately 22 one eight inch cardboard circles placed in vertical position onto the Styrofoam ball using the photo above as a reference guide. Cut a 3" x3" square from the cardboard tube. Cut six petals, but make sure they are not cut through the bottom of the cardboard square. These will be the petals that cover the lower part of the flower head. Curl the bottom petals in the same direction with a pen or pencil. Roll the petals into an oval shape and hot glue onto the base of the flower. Wrap the bottom of the flower and dowel rod carefully with brown floral tape. Make sure that the bottom is fully covered with brown floral tape. Place your flowers in a vase, add some seeded eucalyptus, baby's breath or another type of dried greenery. Admire your creation and be prepared to receive the compliments on your paper flowers! It is hard to believe that such lovely, unique floral creations are made from ordinary cardboard paper tubes!